I've always read that love is supposed to be easy. If you have to fight for it, it's not true love. If they don't immediately, truly, deeply understand you then it just isn't meant to be. And, perhaps, in the world we live in where we try to rush through life, picking up fast-food and arranging family gatherings and signing up for online dating so we can meet someone fast, that is love. But in the world Laura Florand builds--re-creates, really--through her prose, love is filled with messy beginnings and misunderstandings. Yet, it's not less because of those road bumps--it's more because her characters are willing to open themselves up to that type of hurt and pain and failure and try again. After Once Upon a Rose was utterly charming, what with happy-go-lucky rockstar Layla and soft-hearted (but growly) Matt, I didn't expect A Wish Upon Jasmine to be quite so series. Or alluring. Or lovely. Damien, the businessman hero of this novel and cousin to Matt, is hard, cold steel. While Matt grows the roses and guards the valley--a task that often feels like a burden to him in the face of his cousins who manage to travel and slip in and out of their responsibilities--Damien acquires the money that allows Matt to grow his roses and Tristan, their youngest cousin, to make his perfumes. Without Damien's ruthlessness, they wouldn't have the wealth--or much of the happiness--that they have today. But Damien, who so desperately wants to be able to make everyone's wish come true--to support them so that they can pursue what they love--is so much more than that veneer of calculated business acumen. In New York City, on a business venture, with a soft, shy woman named Jess, the true side of himself truly comes out. Only, the next morning Jess leaves his bed without a word. And the next thing he knows, he's bought her company and she's not just Jess, she's Jasmin Bianchi, the woman who created "Spoiled Brat", the perfume that isn't the artistic perfume that critics adore but rather the type of commercial perfume that sells--that made the number two slot and only slipped to number three. And now, six months later, she's in the Rosier Valley, claiming that an old perfume shop that has been in his family for generations has recently come into her possession. And, for Damien, it's a second chance to finally get it right with the one woman who got away. I never know what to expect with a Florand novel. Either they start out cold, with the hero and heroine having never met and creating a complex relationship from the start or they begin layered, with the reader sifting through both the memories and the emotions that already flavor every conversation. With Damien and Jess, there's so much that isn't being said--so much under the surface--and on the surface is all sexual tension and wanting that it's a heady combination. But I enjoyed it so much. Some of Florand's later Chocolat et Amour books, such as The Chocolate Heart, have been the type of romances I wanted to weep at. A Wish Upon Jasmine, though, strikes the perfect balance between heart-wrenching and sweet. I've long since given up trying to hide my feelings for my favorite Florand heros (*ahem* Sylvain Marquis! ), but Damien Rosier is seriously giving my heart a hard time. I adored him as a lover, as a cousin, as a grand-nephew, as a son, as a grandson and, most of all, despite his flaws. And the same goes with Jess, who doesn't believe herself to be worthy of love, let alone of the love of someone as intelligent, gorgeous, and successful as Damien. It broke my heart to see Jess, whose perfume rose to the top of the market when she was only twenty-four, repeatedly battle with herself to gain confidence and believe that she was worth it. But, again, that's what I love so much about Florand's novels; they're as much a love story as they are a coming-of-age story in which her characters experience a tremendous amount of emotional growth. Reading A Wish Upon Jasmine, I was struck by how besotted I am with this new world Florand has created. While I certainly miss the streets of Paris and the taste of chocolate on my tongue, slowly but surely I am being converted to the perfumes and aromas that grace these pages. Moreover, the Rosier family--so intertwined that if one were to change, they all would--has my heart and soul. Florand's previous series had her heroines connected by blood and her heroes moving in the same professional circle but the blood ties were never as strong or as poignant as they are here. I've read nearly all of Florand's novels at this point, with the exception of her own fictionalized autobiography, and yet she never fails to surprise me with the characters she writes up or the depth of her novels. Moreover, her prose only grows more decadent by the novel; lusher, fuller, and all the more realistic. It's all-too-easy to forget you're not actually in the South of France if one of her books is in your hands. As a self-proclaimed fan of her, of course I loved this--I loved this--and it's one of my new favorite Florand novels. What's more, this series is shaping up to be even better than her last and I am breathless with anticipation for the next installment. 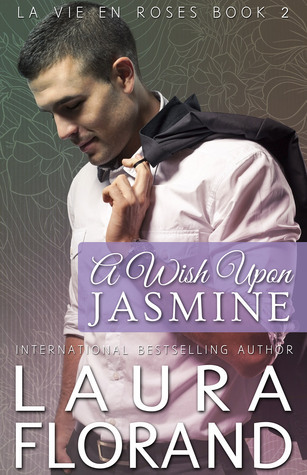 A Wish Upon Jasmine is the all-too-perfect response to a wish you didn't even know you made; simply magical. Ohhhh Damien sounds divine! I honestly don't remember much about him, but I'm sure if I give this novel a chapter or two, it'll all come back in a quick. :) This sounds lovely! It actually makes me cringe every time someone says that love is easy so I'm glad the author doesn't take that approach to her characters and their relationships. I know you and Rachel both are in love with her work, which is recommendation enough for me. I've been reading nothing but romances for ages now, I must find time to squeeze one of hers in. I really need to read this author. Not just this book, but her work. You have me besotted with wanting to try her! Brilly review. I still need to read these two books in this series, I adored Florand's previous series, she was so great at writing a gorgeous romance and also making me hungry all the time with gorgeous desserts. I'm one of those readers that likes to save books from favourite authors so that they can be read on rainy days, so I'm certainly looking forward to diving into these. I'm glad that you've enjoyed these books so far Keertana. Lovely review as always! I absolutely need to pick up a novel by this author!! I know you've loved a lot of her works, and honestly, I don't know what I'm waiting for, ugh. The way you described this book? PHENOMENAL. The plot seems intricate, and I love the sound of its depth. What's more appealing to me is that this book is MORE than just a love story. That's always a concern of mine when I pick up a book that's labeled as a straight romance- because I'm not the biggest romance fan out there (or, well, I don't want it to be JUST romance) (of course I love romances, haha). The fact that these characters not only have such depth, but also that the novel focuses on their growth sounds perfect. Like that's exactly what I'd love in a novel. Both Jess and Damien seem flawed, but I'm sure that's what makes their romance all the more sweeter. Such a beautiful review for a beautiful book, Keertana! I just finished Once Upon a Rose and loved it. While I loved Matt, Damien is the character that intrigued me the most. I‘m looking forward to read his story, and August can’t come fast enough. I totally agree that Laura Florand writes amazing characters and vividly pictures France, and Rosier family has my heart too. I haven't heard of this series before, but after reading your review, it's definitely one I want to look into! I love the sound of Damien, (he seems so swoon-worthy) and I'm super intrigued by the plot of this story! I just love how in-depth your reviews are! It shames me to admit that as a huge contemporary romance fan, I have yet to read a Laura Florand book. They are recommended to me all the time, and I'm sure I'd love them. Her writing seems absolutely gorgeous and her stories just full of "true love", the real kind, like you said. I'm glad this one ended up being one of your favorites! The characters sound amazing, very easy to relate to. I hope I can pick it up soon! Ummmm. Why haven't I read this author yet Keertana. WHY?!!!! Her romances sound outstanding, and there's nothing better in a romance than sexual tension. I live for it:) Gorgeous review my friend! Did you know you can shorten your links with AdFly and earn money from every visit to your shortened links.